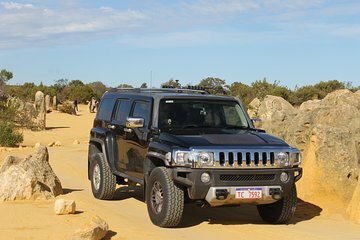 Experimente algunas de las maravillas naturales de Australia Occidental, incluidos los Pinnacles, en un viaje Hummer de un día completo desde Perth. Conduce a lo largo de la costa del Océano Índico y explora los Pináculos, un desierto de antiguas agujas de roca. Además, visite Thirsty Bay y el lago Thetis, conduzca en un viaje fuera de la carretera y conozca a los canguros y koalas en Caversham Wildlife Park. Un almuerzo de barbacoa por el río Moore, transporte por Hummer 4WD y una degustación de vinos opcional, si el tiempo lo permite, incluido. Pequeño grupo de no más de cuatro viajeros. Comience su viaje de un día con la recogida en el hotel en Perth. Conozca a su guía de conductor y grupo de no más de cuatro pasajeros, y súbase a su Hummer 4WD con control climático. Luego, disfrute de las vistas mientras sigue la nueva carretera del Océano Índico hacia el norte, hacia el desierto de Pinnacles del Parque Nacional Nambung. Disfrute de las vistas del Océano Índico en la ruta y escuche datos fascinantes sobre las agujas de los Pináculos, uno de los paisajes más misteriosos de Australia, de su guía. Después de haber explorado aquí, conduzca hacia el norte hasta Cervantes y visite el lago Thetis, un lago natural que alberga estromatolitos: fósiles vivientes formados por microbios a través de los milenios. Luego, diríjase a Thirsty Bay, una impresionante y amplia curva de costa bordeada por una playa de arena blanca y el Océano Índico turquesa. Absorba los espectaculares panoramas aquí, y pase por el pueblo pesquero de Seabird antes de conducir por la hermosa costa. Después de 45 minutos, vuelva a unirse a la carretera y deténgase en Guilderton para disfrutar de un delicioso almuerzo de barbacoa, que incluye marisco local fresco, junto a la desembocadura del río Moore. Debidamente renovado, conduzca hacia el sur a través de las regiones agrícolas de ganado vacuno, ovino y caprino hacia Swan Valley y Caversham Wildlife Park. Conozca algunos de los animales salvajes del parque, incluidos los koalas y los canguros, y si el tiempo lo permite, disfrute de una cata de vinos en la histórica bodega de Sandalford. Reciba un DVD de su día antes de que concluya su viaje con un traslado al hotel alrededor de las 5:30 pm. This was a good tour. We covered a lot during the day. The tour guide collected us at our accommodation and was very informative. The vehicle was comfortable. The tour was well paced with frequent stops so that we never really felt how long the day was. We felt as if we got enough time at each stop and it was really quite remarkable that after about an hour and a half at Caversham Park we still did a wine tasting. Highly recommended. Wayne our guide arrived at our hotel as agreed just before 7am. He took us out to see Moore river and then onto a lighthouse. Then he drove us to the Pinnacles. We went into the park and spend time photographing the different structures, which were really amazing. Lunch followed, fish and chips, the batter on the fish was wonderful. The next part of the trip took us to the stromatolites in Lake Thetis and then onto some amazing sand dunes. The final stop was to Caversham Wildlife Park were we spent a very pleasant time with the kangaroos and other animals. The park is exceptionally well designed to give the visitor a wonderful experience. We returned to our hotel a little after 6pm. Wayne was an exceptional guide who is both knowledgeable and passionate about the countryside that he took us to. In all I think that this was one of the best day trips that weve ever experianced and we would rate it at 6 stars if we could. If we found ourselves in Perth again we would have no hesitation in booking this trip again. Our driver Wayne was doing an excellent and wonderful job. He was a very careful driver and extremely helpful in all ways. I found the places where I visited were very interesting. I have no hesitation to recommend the trip to everybody. Our tour guide Wayne was very knowledgable and ensured we saw all the sites we wanted. The whole day was very enjoyable. We choose this tour because is was a small group, no larger than four people in a small hummer 4 wheel drive. Most other tours are coach based. The Hummer was able to take in places the coach tours could not travel. We were taken on an almost 5km tour around the Pinnacles, with stop included for a walk and photos. Coach tours cannot do this. This was an absolute highlight. On the way we stopped at some beautiful bays and sand dunes. The driver/guide Wayne had a professional drone, in which he took video of day and it will be sent to us on a DVD. Wayne provided fantastic commentary throughout the day and even some great recommendations for wineries. Considering our group was small, we were able to keep the itinerary flexible and spend more time in Swan Valley on our return to Perth. This was an amazing day and highlight while visiting Perth. I would highly recommend Hummer Safaris and Wayne. I'm so glad we booked this small tour rather than a coach tour - we saw so much more! My tour with Terry was absolutely fabulous and exactly as described. He was punctual , personable and informative. The tour was perfectly put together to get the most of the western coast and Australian wildlife encounters in one day. It was just me and my teenage daughter and our guide made us feel safe and comfortable so much so that by the end of the trip, I was left feeling as if I have known Terry for years not just hours. Each stop was enough time to thoroughly enjoy the individual site and our stop for lunch made us feel like the locals and not just tourists. There was so much to do but we never felt rushed. You won't regret picking this tour on your trip to Western Australia! Amazing day - tour guide very friendly, knowledgeable and a pleasure to share our day with. We saw everything on the itinerary and more! An exciting adventure off-roading along the coast, beautiful scenery and lots of opportunity for photographs and to enjoy the sights :) Perfect day out, thank you!